Suffering from Toothache? It could be because of a badly infected teeth. Don’t panic, we won’t let you loose your tooth. We help save your tooth by performing the right dental treatment. All cavity affected, or decayed tooth need not to undergo Root Canal Treatment. 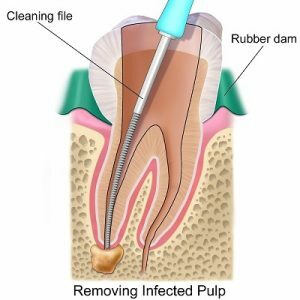 The root canal treatment is needed only when you have a painful teeth which is badly infected, and the infection reaches the nerve (Pulp). If infection or cavity is not reaching pulp, you can save the tooth just by performing Tooth Filling procedure. But if the infection reached the pulp, Root Canal Treatment is the best way to save the tooth, or else the tooth must be removed. At Dr Paul’s Dental Health Care, we suggest RCT only when it is absolutely indicated. If you are in need of Root Canal Treatment (RCT) in Bangalore, we at Dr Paul’s Dental Health Care assure you a painless Root canal treatment in Indiranagar, Bangalore, India. Many people are afraid of root canal treatment asking whether it is painful? Indeed, it’s totally painless if it is done by a skilled root canal dentist or root canal doctor known as “Endodontist”. To make the Root Canal Treatment totally painless, right from giving anesthesia it requires great expertise and attention. At Dr Paul’s Dental Health Care, we assure you that you are in the right hands of the best dentist in Bangalore and in most of the cases, root canal treatment will be done in single visit. At Dr Paul’s Dental Health Care, we do absolutely painless root canal treatments as we have highly qualified, skilled endodontists dedicated to RCTs. To make the entire procedure painless, we have developed a system to give painless injections too. At Dr Paul’s Dental Health Care, the root canal procedure is done under Local Anesthesia (LA) which is given by a painless injection technique. The root canal dentist, then proceeds to remove and clean thoroughly the decayed and infected tissues inside the tooth (Pulp) and root canals. The cleaned root canals are sealed using a Latex based Materials called Gutta-percha. The root canal doctor restores the tooth cavity using tooth filling materials like composites. Finally, Zirconia or Ceramic caps or crowns are given to protect the entire tooth from breaking or cavities. At Dr Paul’s Dental Health Care, we always give Computer-aided Design/Computer-aided Manufacturing (CAD/CAM) designed Zirconia or Ceramic caps because of their superior fit and durability. Having employed the best endodontist or root canal dentist in Bangalore to ensure a perfect root canal filling and finishing it with one of the world’s best branded Zirconia Caps, Dr Paul’s Dental Health Care walk the extra mile to make sure that you get the best root canal treatment in Bangalore in a painless way! Severe toothaches can be due to infection inside the tooth and a simple pain-free root canal treatment reliefs you from such toothaches. But many patients assume root canal cost them a lot of money, and decide to live with the toothaches. That’s not true, because there are multiple options available today. However experienced dentists don’t recommend cheap options simply because they don’t want to compromise quality of service they offer, and loose their patients trust. Root canal cost in Bangalore or anywhere in India isn’t fixed as it’s hard to pinpoint the cost until dentists start the work because many times, X-rays do not always show the full extent of decay. Hence, the cost of root canal vary depending upon affected tooth and severity of decay. At our clinic, we always provide an estimate root canal cost range to patients prior to the service, if you would like to know more about root canal procedure and cost, please contact our dental clinic in Indiranagar, Bangalore, India.